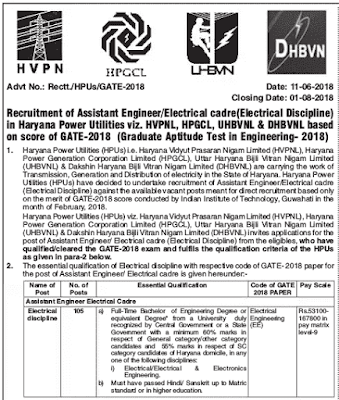 Haryana Power Utility Vacancy through Gate 2018: Haryana Power Utilities has recently given a notification of 105 Assistant Engineer Electrical Cadre Jobs for direct recruitment based only on the merit of Gate-2018. The interested candidates can apply for the Haryana Power Utility Recruitment 2018 on or before 01 August 2018. If you are looking for Jobs in HPVNL then you are at right place. 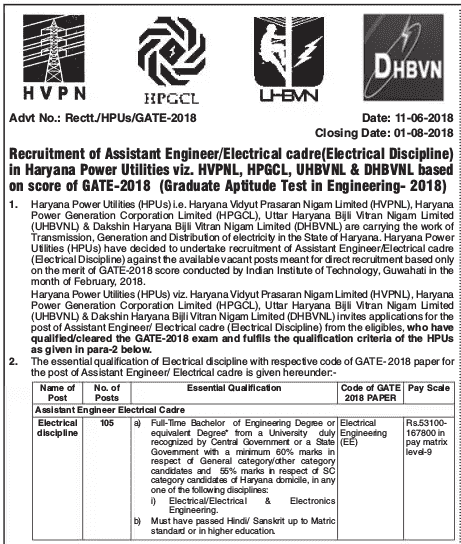 Haryana Power Utility Recruitment through Gate 2018-19 notification is out. As per the Notification, there are 105 Assistant Engineer Electrical Cadre Vacancies. The educational qualification is Full-Time Engineering degree. The age limit is 20 to 42 years. If you are looking for Assistant Engineer Jobs in Haryana Electricity Board through GATE then this article is going to be very helpful for you. The candidates should have Full-Time Bachelor of Engineering Degree or equivalent degree from a university duly recognized by the Central Govt. or State Government with at least 60% marks for the general category candidates and at least 55% marks for the candidates of SC Category of Haryana domicile. Note: The candidates should have passed the Hindi/Sanskrit subjects up to the matriculation standard. The age limit for the Assistant Engineer is 20 to 42 years as on 01.08.2018. PWD (SC, BC-A, BC-B): 10+05 years. ESP (SC, BC-A, BC-B): 05 years. Rs. 53100-167800/- in pay matrix level-9. The candidates applying for Haryana Power Utilities Assistant Engineer Vacancy should have qualified the Gate-2018 (Graduate Aptitude Test in Engineering – 2018) conducted by the IIT, Guwahati in Feb-2018 in correspondence paper (Electrical Engineering). The selection of the candidates in each category would be done by the HPUs from the eligible candidates, purely on the basis of score of the GATE-2018 in respective discipline as per requirement of HPUs. The qualifying marks in respect of GATE 2018 (minimum cut off) shall be declared by GATE-2018 organization institute IIT Guwahati for respective GATE paper/discipline/ category as given below. The selection process consists of marks obtained (Normalized Marks out of 100) in the correspondence paper of GATE – 2018. No interview for the Assistant Engineer Post will be carried out for the posts being advertised by HPUs. Appointments will be made purely on the basis of merit of the GATE-2018, GATE Score or 2017or prior will not be valid. Rs. 500/- for the male candidates of general category including the dependent son of Ex-Servicemen of Haryana and Male candidates of all reserved category of other states. Rs. 125/- for the female candidates of all (General and reserved) category of all states. Rs. 125/- for the male candidates of SC/ BC-A/ BC-B/ ESM categories of Haryana only. No application fee for PWD candidates. Note: The application fee can be paid online through Debit/Credit card or Net banking. You can submit Haryana Power Utility online application 2018 through the official website of HPUs before 01.08.2018. Proof of Qualification along with marks sheet. Proof of norms adopted by the university to convert CGPA/ OGPA/ DGPA into the percentage. GATE Score card issued by IIT, Guwahati. Disability Certificate (for PWD Candidates). Discharge Certificate in Case of Ex-Servicemen Candidates. Sports Graduation Certificate in case of Sports Persons. Latest Eligibility Certificate issued by the Secretary, Zila Sainik Board, Haryana in case of Dependent of ESM candidates. Cut Off Date for the purpose of Age Limit: 01 August 2018.